Although not as well-known or as architecturally significant as some of the other religious sites in the Golden Ring, this monastery played an important role in early Russian history. 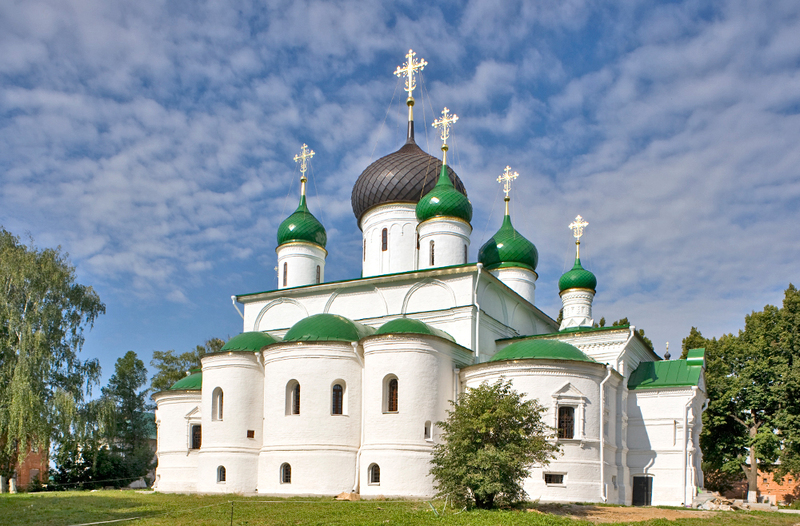 Among the host of monasteries in the ancient town of Pereslavl-Zalessky, the Feodorovsky Convent makes a relatively modest impression. It lacks the vivid 17th-century frescoes of the Trinity Monastery, the exuberant Baroque decoration of the Goritsky Monastery and the monumental architectural ensemble of the Nikitsky Monastery. Yet its historical significance is equal to any of these. The Feodorovsky Monastery, as it was originally known, was founded in the wake of a decisive event in the prolonged power ​struggle between the Moscow and Tver principalities, one of the defining contests in Russian history during the two centuries following the Mongol invasion (1237-1241). By the 14th century, Pereslavl-Zalessky, located some 90 miles northeast of Moscow, had become an important center within the Muscovite principality and thus drew the hostile attention of its rival, Tver. The site on on the southern edge of town where the monastery stands is traditionally thought to have been the place of an intense battle between Moscow and Tver on June 8, 1304. In the Orthodox Church calendar, this day is dedicated to St. Theodore (Feodor in Russian) Stratilates, a Roman officer martyred for his Christian faith in 319 and considered the patron saint of warriors. In the battle, the forces of Prince Yury Danilovich of Moscow succeeded in defeating the troops of Tver’s Prince Mikhail Yaroslavich (1271/72-1318). The Tver forces were led by Akinf Gavrilovich, a renowned hero who perished in the fighting. In gratitude for his victory, Prince Yury established the monastery and dedicated it to St. Theodore Stratilates. The following two centuries brought little distinction to the Feodorovsky Monastery, and there is scant information about the institution until the 16th century. In all likelihood it was sacked, along with the rest of the town, by the Tatar Khan Tokhtamysh during his invasion of Russia in 1382. Buses for Pereslavl-Zalessky leave every hour from Moscow's Shchyolkovsky Station. The journey takes around 2.5-3 hours. In the mid-16th century, Ivan the Terrible — a frequent benefactor to Pereslavl-Zalessky — gave support to the monastery for the construction of a large brick church dedicated to St. Theodore. The structure was in effect a votive offering in celebration of the birth of Ivan’s second son, Feodor, in 1557. Traditional accounts state that Ivan’s wife, Anastasia Romanova, gave birth to Feodor some three miles south of the monastery at a site subsequently commemorated by a brick chapel. With Feodor’s death in 1598, Russia’s first dynasty, the Riurikovich, came to an end. Although lacking the extravagantly complex form of St. Basil’s on Red Square, built during the same period, the Church, or Cathedral, of St. Feodor Statilates is an important landmark in the consolidation of 16th-century Muscovite church architecture. Its massive cuboid structure rises to support five cupolas in a design that had been established at the turn of the 16th century. This form was widely adopted for the design of parish churches in the 17th century. The façades are divided into three bays, each of which culminates in a semicircular gable known as a zakomara. Chapels attached to the north and south facades contained altars dedicated to the Feodorovsky Icon of the Virgin and, later, to St. Seraphim of Sarov. A narthex, or vestibule, enclosed the main entrance in the west. On the interior, the​ upper part of the structure is illuminated by light through narrow windows in the cylinders that support the cupolas. The interior space is segmented by piers, with the main aisle leading from the primary entrance in the west to the apse containing the altar in the east. The apse is divided into three parts, with the altar in the center flanked by a prothesis for the preparation of the Eucharistic sacraments in the north and a diaconicon for the priest’s vestments to the south. Over the centuries the structure was modified numerous times. For practical reasons, t​he curved gables of its roof line were capped with a flat roof, probably in the 18th century. The narthex was rebuilt in 1704, and in 1886, a new gallery was built along the south, west and north facades. The cathedral interior was presumably painted with frescoes, but they have not survived. In their place are wall paintings done in the early 19th century by Nicholai (Salvatore) Tonci (1756-1844), a Russified Italian born in Rome. He arrived in St. Petersburg in 1795 and moved to Moscow 1800 where he married the older daughter of Prince Ivan Gagarin and circulated in high society. Tonci was widely praised as a painter of religious subjects, and it is fortunate that his wall paintings at the Feodorovsky Monastery have survived. Although damaged during the Soviet period, they are undergoing restoration. In an interesting personal note, his daughter became a novice at the Convent of St. Theodore. In 1608, the town and its monasteries were again sacked — this time by Polish-Lithuanian forces during the dynastic interregnum known as the Time of Troubles. As with so many other Russian settlements, decades were required to recover from the widespread destruction. By the middle of the 17th century the monastery was faced with a dwindling number of monks. After a devastating outbreak of plague in the area during the early 1660s, the town was left with many women and young girls without families whose only remaining source of support was the church. Lack of space in existing convents and the acute need led to a decision by Patriarch Joseph — supported by Tsar Alexei — to convert the largely empty monastery to a convent in 1667. The Feodorovsky Convent quickly achieved viability, and by the 18th century it had become a center for weaving, embroidery, needlework, pottery and icon painting. Peter the Great, a frequent visitor to Pereslavl-Zalessky, took a personal interest in developing the convent’s production of fabrics. The convent was also supported by donations from Peter’s mother, Natalya Naryshkina, as well as from other relatives of the tsar. During this period, the convent gained a refectory church dedicated to the Presentation in the Temple (1710) and an infirmary church dedicated to the Kazan Icon of the Virgin (1714). Two wings of brick cloisters, originally built in the 17th century, were rebuilt in the 19th century. And in 1681, the convent territory was enclosed by a brick wall. Although there were insufficient resources to build the usual church over the main entrance gate, a small chapel and bellcote were built over the gateway in the late 17th century. By the turn of the 20th century, the Feodorovsky Convent had as many as ​400 nuns and novices under the devoted supervision of Mother Evgeniya (1832-1920), who served as hegumenia (mother superior) from 1875 to 1916. Closed in 1923, the convent was used for a typical assortment of purposes during the Soviet era, including a colony for abandoned children and workers’ housing. The Feodorovsky Convent was returned to the Russian Orthodox Church in 1998 and administratively linked to the nearby St. Nicholas Convent. It is now in active use and the positive results of a careful and gradual restoration are visible throughout the ​carefully maintained grounds.